To play better golf, you've got to practice. But "practice does not make perfect. It makes permanent." Remember that. If you practice bad techniques, your bad techniques will become... permanent. They'll become second nature in you. Training, in the sense of physical conditioning, is relatively not of great importance, unless we are engaged in golf tournament play. 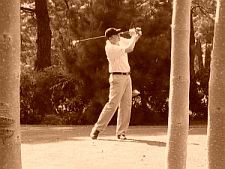 Average golf players, once they get out on the course a few times in the spring, find no physical difficulty in playing an eighteen-hole round. Often they are fresh enough to play eighteen more holes, or nine, anyway. But technique is something vastly different. A siege of training that would bring a person to peak physical condition probably would not knock one stroke off his/her score for eighteen holes. But a 50 per cent improvement in his/her technique of hitting the ball — his/her golf swing — could drop his score from the 90's into the 70's. That technique is what we are looking for so desperately. Why don't we have it? "If you practice bad techniques, your bad techniques will become... permanent. They'll become second nature in you." The answer, in the large general sense, is because the golf swing is extremely subtle. The essential actions are small actions, not readily seen with the naked eye, and from which attention is constantly diverted by the larger, more spectacular actions which surround them. A second reason is that golf always has had the peculiar faculty of making its players think they were doing things that they were not doing at all, and vice versa. This led, a long time ago, to the establishment of a great many theories and principles which seemed sound and reasonable but which were altogether wrong. For example. Around the time of World War I the late Jim Dante, one of the authors of The Nine Bad Shots of Golf, was a young assistant pro at the Baltusrol Golf Club in Springfield, New Jersey. Harry Vardon, the great English professional, was touring America. He played a round at Baltusrol and explained his theories and his teaching methods to the Baltusrol pro, the late George Low. Low later passed them on to his assistants. "But Mr. Low," objected the observant Dante, "Vardon doesn't hit the ball the way he says to hit it." "The hell with how Vardon hits the ball!" roared Low. "You teach the way Vardon says, or look for another job."